Steps to Reset Brother MFC-7840W Laser Printer Toner Cartridge | TonerGreen - Eco-Friendly Toners from the U.S. Brother MFC-7840W laser printer is a great printing equipment for small-to-medium size businesses or even if you work out of your home office. And if you happen to own a Brother MFC-7840W, then perhaps you have encountered a problem that pops out as an error message saying "'Toner Life End" even if you have just installed new toner cartridges on it. 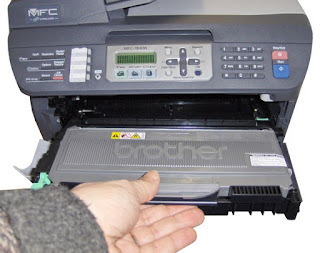 Well, don't fret, that's just normal, that's why for today's article, we're going to teach you how to reset your Brother MFC-7840W Laser Printer and fix up this thing. Step 1 - Open the front door where you access the toner. Step 3 - DO not type in 1 or 2! instead, type in *00 on the keypad and you should be rewarded with "accepted". Step 4 - Close the front door. Toner counter is reset. Step 5 - Let the printer take time, refresh you desktop and then check again the toner level. After that, you can now resume back on printing your documents. Brother MFC-7840W laser printer uses Brother TN360 toner cartridge as its replacement toner cartridge. Looking for Brother TN360 toner cartridge? TonerGreen offers Eco-Friendly Remanufactured Brother TN-360 High Capacity Black Toner Cartridge for your Brother MFC-7840W laser printer. Our Brother TN-360 High Capacity Black Toner Cartridge is Eco-Friendly! Remanufactured with up to 75% recycled components, our Brother TN360 Toner Cartridge is thoroughly engineered to meet or exceed OEM specifications. All our ink and toner cartridges are backed by 100% Risk-Free Guarantee.